An unexpected hero emerged for the University of the Philippines Fighting Maroons. 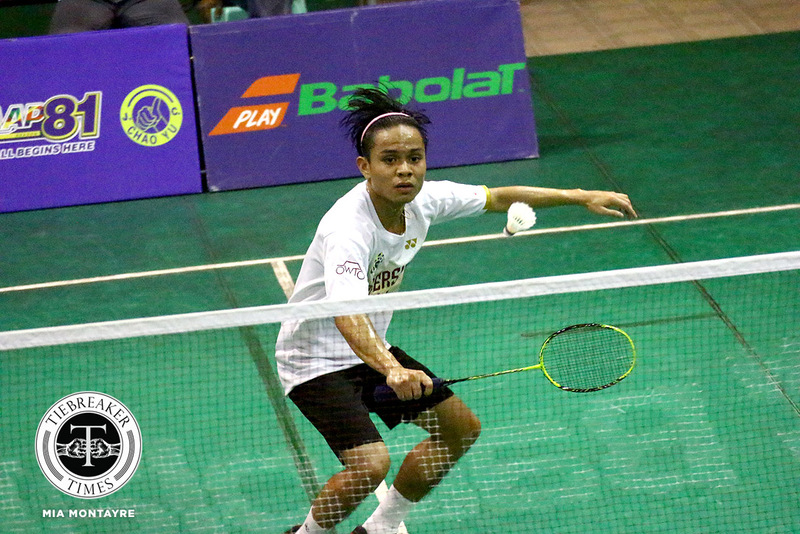 First-year UP shuttler Kyle Legaspi played like a veteran in the deciding singles set and steered the Fighting Maroons to their second straight Finals appearance with a 3-2 win over the Ateneo de Manila University Blue Eagles, Monday morning at the Rizal Memorial Badminton Hall. 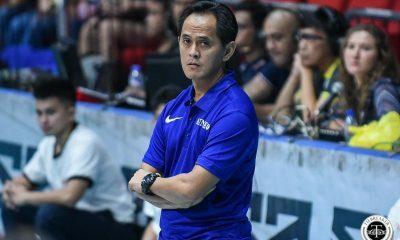 The Far Eastern University Diliman alumnus was stunned that the Ateneo had adjusted their lineup, pitting him against the latter’s captain and senior Carlo Remo in the possible anchor match. “Yung mindset ko agad sa self ko ay mas maging matibay sa mga rallies and gagawin ko lahat para sa team. Nag-pray ako ng maigi and nag-warm up ng maayos para ‘pag pasok sa court warmed up na ako,” said the freshman. The two neighboring teams split their first four matches leading to the third singles match in mind-boggling score lines. UP’s JM Bernardo and Ateneo’s Keoni Asuncion pulled off contrasting victories in the sets they played over Fides Bagasbas and Michael Clemente, respectively, in the first two singles contests. For his part, Bernardo had to fend off a slow start in the opening frame to squeeze past Bagasbas. In the second frame, the third-year Maroon stormed out of the gates and his flurry of points were too much for his opponent. UP took the 1-0 lead at 24-22, 21-4. Afterwards, Asuncion was formidable in the opener of his own match over Bernardo’s teammate Clemente and punctuated the frame with a well-placed cross-court hit for the 21-8 win. The former Rookie of the Year then had to take advantage of his opponent’s lack of killer instinct and eventually finished the long and arduous second set after clinching his lone match point at 30-28. After a few minutes of rest, Asuncion and Remo linked up to put the Blue Eagles at the lead at 2-1 after dominating Betong Pineda and Harvey Tungul in two sets at 21-19, 21-14. 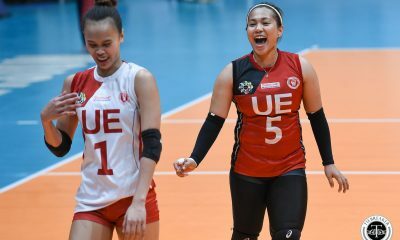 The lead did not last long, however, as UP captains Vinci Manuel and Bernardo level the tie at two 21-15 score lines. This set up the heroics of the rookie to overcome his more seasoned opponent. Legaspi also shared that he had been nervous just minutes prior to his match, but he was determined to get it right there and then. With his team mates egging him on, the former age-group campaigner shockingly clinched the first game at 21-12. And even if he himself was surprised, he kept going. Not wanting this match to be his last, the graduating Remo fought hard and took advantage of the more relaxed play of Legaspi, eventually dominating the following frame at 21-9. But that did not stop the rookie from Diliman as he returned to a more clever approach to take the lead at 19-11. His senior opposition tried to keep in step with him and even trimmed the lead to three at 16-19. 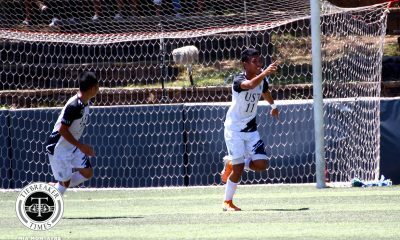 But it was two points needed and two points clinched – a clean passing shot and an error from Remo, and Legaspi sent UP back to the last dance. After the win, the newbie was in awe of what had just happened. He exclaimed, “Sobrang saya ko after manalo kasi worth it lahat ng hirap at pagod sa training. Lahat ng gising namin ng five’o clock ng umaga and training ng five ng gabi naging worth it. 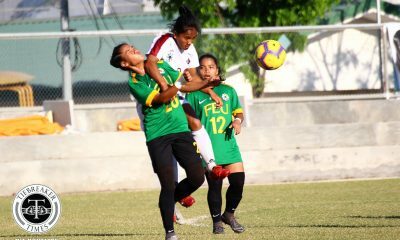 The first tie of the best-of-three ties Finals between the reigning four-time champions National University Bulldogs and UP is scheduled on Wednesday, October 10, at the same venue.